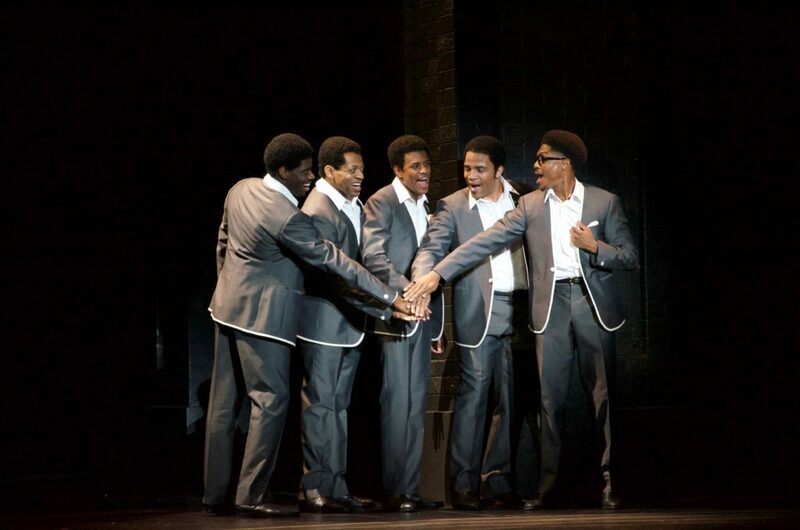 “Ain’t Too Proud: The Life and Times of the Temptations” officially opened on March 21st and I ain’t too proud to say the musical housed at the Imperial Theater, located at 249 West 45th Street in Manhattan is nothing short of sensational. The show is perfection in every aspect: the choreography of Sergio Trujillo, the musical orchestration by Harold Wheeler, the costumes by Paul Tezewell and the direction of Des McAnuff is pure genius. McAnuff structures each scene building and building until it reaches a crescendo. The scenic design and backdrop is inventive, creative and beautiful thanks to the imagination of Robert Brill. This is one of the most talented cast I have ever seen to take the Broadway stage. Derrick Baskin plays the role of Otis Williams, the founder and one of the original Temptations. He is the narrator of the unfolding story of the life and times of the Temptations, introducing each Temptation as they evolved and joined the group. Informing the audience of their vices and triumphs and of each Temptations’ departure. Paul Williams is performed by James Harkness, Melvin Franklin (Jawan M. Jackson), Eddie Kendricks (Jeremy Pope), David Ruffin ( (Ephraim Sykes), Dennis Edwards (Saint Aubyn), Damon Harris and Smokie Robinson (Christian Thompson) and Otis Lamont is portrayed by Shawn Bowers. E. Clayton Cornelius performs as Richard Street and Berry Gordy is played by Jahi Kearse. The audience is treated to the songs of the Supremes played by Candice Marie Woods (Diana Ross), Florence Ballard and Tammi Terrell (Nasia Thomas) and Mary Wilson (Taylor Symone Jackson). Otis Williams wife Josephine was played by Rashida Scott. The eager crowd was left hoot-in’ and hollering, tapping their feet and rocking their heads to songs like “Get Ready,” “I Wish It Would Rain,” “The Way You Do The Things You Do,” “Runaway Child, Running Wild,” “You Can’t Hurry Love,” “Gloria,” “Cloud Nine,” “I Can’t Get Next To You,” “What Becomes of the Broken Hearted,” and many other songs in the Temptations songbook that gave the show and its performers an uproarious standing ovation. “Ain’t Too Proud” is electrifying! The show is filled with the unforgettable dance numbers orchestrated by these chart toppers and Rock & Roll Hall of Fame Famers. The Temptations added 42 Top Ten hits, and 14 #1 songs to their credit during their career. Only love and brotherhood could enable these multi-talented stars to reach such incredible heights. Written by three-time Obie Award winner Dominique Morisseau, the show is destined to win a Tony and is deserving of every other award that honors it. “Ain’t Too Proud,” is the crème de la crème on Broadway. Don’t Runaway Child…Go wild! Save your ducats and go see it! You won’t be disappointed.